Fingers crossed, but I think we have it all figured out!!!! We are going to drive Echo to Georgia on June 16th to stay with a lady named Cindy. She sounds like a great lady, has experience with disabled pets (has a ferret that is paralyzed and owned a cat with kidney failure) and has the time to take care of him. Again, I can't thank you all enough for the help, support, and prayers!!! I am sooooooo excited and upset at the same time. On one hand, I found someone that can care for Echo, and provide him the time and care he needs and deserves. On the other, I have to say goodbye to one of the greatest animals I have ever met. June 16th is gonna be one emotional day. Again thanks everyone for all of your help!!!!!!! Echo is a special needs dog who just doesn't understand why his life has changed. He's ready to pick up where he left off and now it's with his wheels. Echo needs that new home as soon as possible. Could that be you or someone you know?? Please share his story, or better yet..call his heartbroken owner and let him know Echo is going to be just fine. He is neutered (but don't tell him that! ) His annual vaccinations are due in June. His owner is willing to have those done for his new owner and also willing to help with transport if you are not close by. 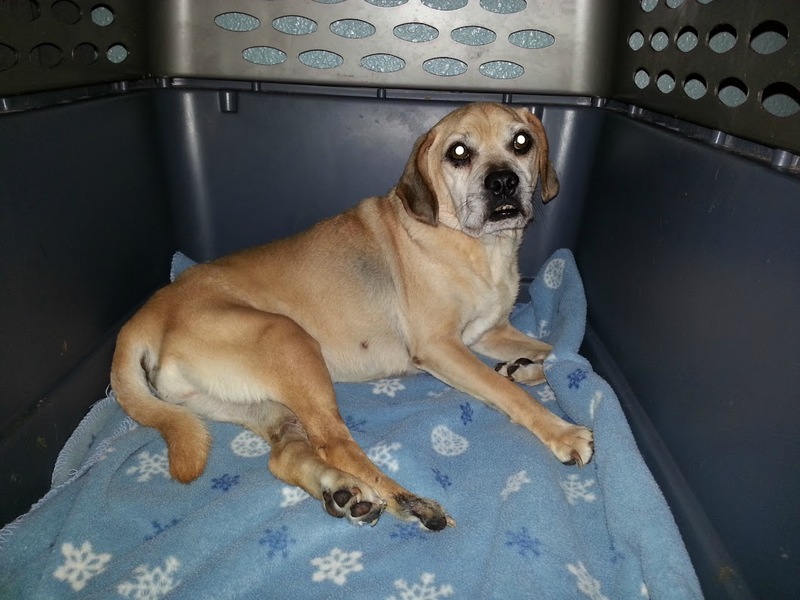 "While shopping at Petsmart for our other dog, we happened upon an adoption day and found an adorable puggle, Echo. He came home with us that evening for a “trial run” (we all knew he wasn’t going back) and has been with us ever since. He led a normal dog life up until 4 years ago. I came home from work to a dog in obvious pain and within hours he lost the ability to use his back legs. We rushed him to an emergency vet, and despite quick diagnosis of a ruptured disc and surgery, Echo was never able to fully recover. 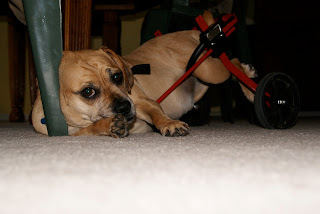 While his back legs haven’t worked since, his spirit has never been broken. Two days after surgery, Echo drug himself out of his kennel and over to me on the floor just to lick my hand (I swear it was his way of telling me everything was going to be ok). 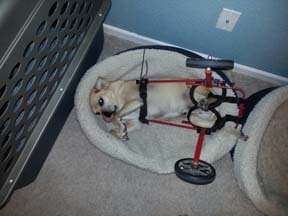 Echo does require expressing due to his paralysis. A daily schedule of expressing and he is good to go. The past 4 years have been a challenge, but Echo’s spirit and energy have never faltered. This is the reason that posting this is incredibly hard for me. Since Echo’s injury, my wife and I have brought 2 children into the world, and Echo has gone from being the baby to spending far too much time in this kennel due to me picking up a new job and the kids. C.mon guys...I really want to play! Understandably, he has become increasingly cranky and uncomfortable around the kids. He misses the old days when he was the center of attention and being his corny loveable self. I love this dog more than I care to admit most days, but I just don’t have enough time to give him anymore and he spends a lot of time in his kennel because of the hours I work. Echo does not deserve the hand he has been dealt, and it is totally unfair to euthanize him because of what has happened, especially when he is a loving, caring, wonderful dog. However, if I cannot find him a home or a rescue, that is what we are left with. They say a picture is worth a thousand words...Echo has so much to say...take a look! He needs a loving hand and someone with more free time than I have currently. His ideal home would be without children. He is good with adults and most dogs. Echo longs to be a companion to a person or family who will take him for walks and let him cuddle and snuggle the way he did before he became handicapped. Just look at his pictures. Nothing has changed for him other than he now has his own set of wheels. 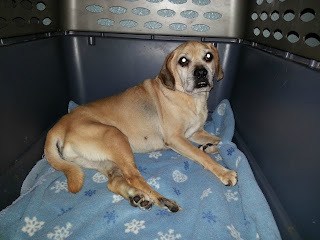 Please help as he is a great dog, and it really isn’t fair to euthanize him because of this."